Chicken coop signs are a fun, finishing touch to your backyard coop projects. With a little leftover lumber and paint, you can make one in no time. 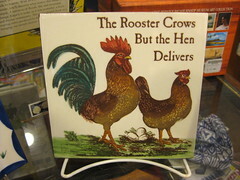 Can you tell me where I can get the sign the rooster crows but the hen delivers, as I think this would be perfect for my new coop. I see, that your blog needs unique and fresh content.